Health authorities will begin distributing an experimental Ebola vaccine in Mbandaka, a major city in the Democratic Republic of Congo this week, to try to stop the spread of the deadly virus. The confirmation of the first case in Mbandaka, a city of 1.2 million people, has raised concerns that the virus could spread faster than expected. The vaccine, called rVSV-ZEBOV, will likely be distributed to some 8,000 to 10,000 people in its first phase, Peter Salama, deputy director-general of emergency preparedness and response at the WHO, said Friday. It will be given to people who have had contact with people infected with Ebola and contacts of those contacts, Salama said. Ebola is an incredibly contagious virus which causes the sudden onset of symptoms including fever, fatigue and muscle pain within two to 21 days after infection. Patients suffer vomiting, rash and diarrhea, impaired kidney and liver function -- and in some cases internal and external bleeding. An outbreak in 2014 in West Africa killed more than 11,000 people in months. The rVSV-ZEBOV vaccine was previously given to people in contact with patients who had confirmed cases of Ebola in Guinea in 2015 and 2016, and proved quite effective. But this will be the first time the vaccine is being employed to control the spread of Ebola, according to Dr. Anthony Fauci, the director of the National Institute of Allergy and Infectious Diseases in the United States. The WHO has already deployed more than 5,000 doses of the experimental vaccine in Kinshasa, the country's capital, with thousands more expected to arrive. Dr. Robert Steffen, the chairman of WHO's Emergency Committee, said Friday that 25 people have died in the outbreak and 45 cases have been reported, including three in health care personnel. Among the 45 cases, 14 have been confirmed as Ebola, mostly in the remote Bikoro health zone, although there's one confirmed case in Mbandaka, the capital of Equateur Province. The Democratic Republic of Congo's health ministry released slightly different numbers Saturday. It said in a statement that there have been 43 cases of hemorrhagic fever with 21 probable cases of Ebola, 17 confirmed cases and five that are suspected. 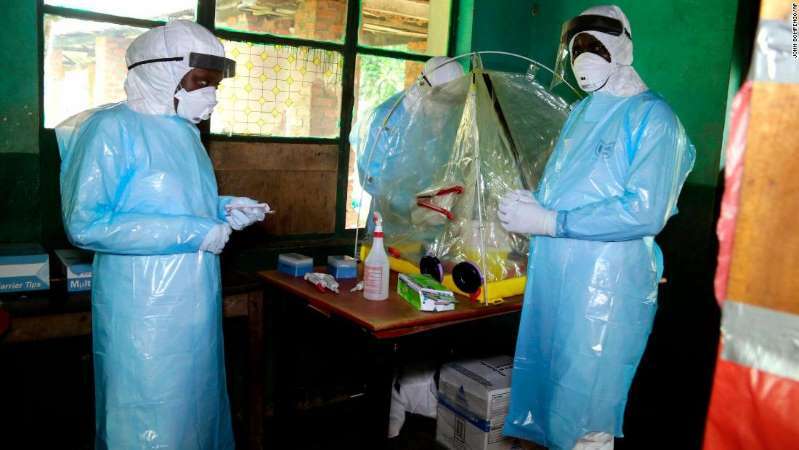 DRC Health Minister Dr. Oly Ilunga Kalenga said the discovery of a case in Mbandaka was particularly worrisome, as the Ebola virus is highly contagious once victims start showing symptoms. Nine neighboring countries, including Republic of the Congo and Central African Republic, have been advised that they are at high risk of spread and have been supported with equipment and personnel. The World Health Organization held an emergency meeting Friday and declared that the situation is not yet a so-called Public Health Emergency of International Concern. WHO Director-General Tedros Adhanom Ghebreyesus is expected to address the annual world Health Assembly on Monday and is expected to discuss the outbreak. The US Agency for International Development has already given $1 million to fight the Ebola outbreak. CNN's Euan McKirdy and Jacqueline Howard contributed to this article.